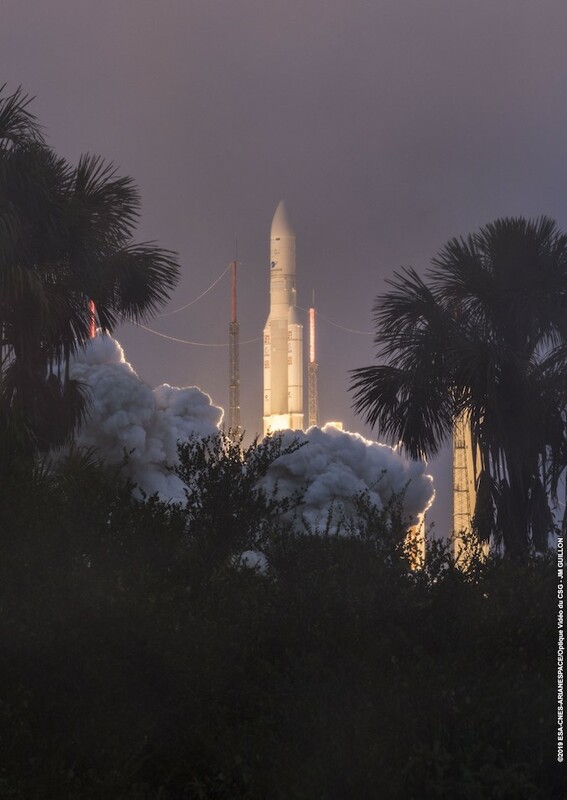 The nearly 18-story-tall Ariane 5 lifted off at 6:01 p.m. local time (2101 GMT; 4:01 p.m. EST) Feb. 5 from the Guiana Space Center, a European-run spaceport on the northeastern coast of South America, with two telecom satellites heading for geostationary orbit more than 22,000 miles (nearly 35,000 kilometers) over the equator. 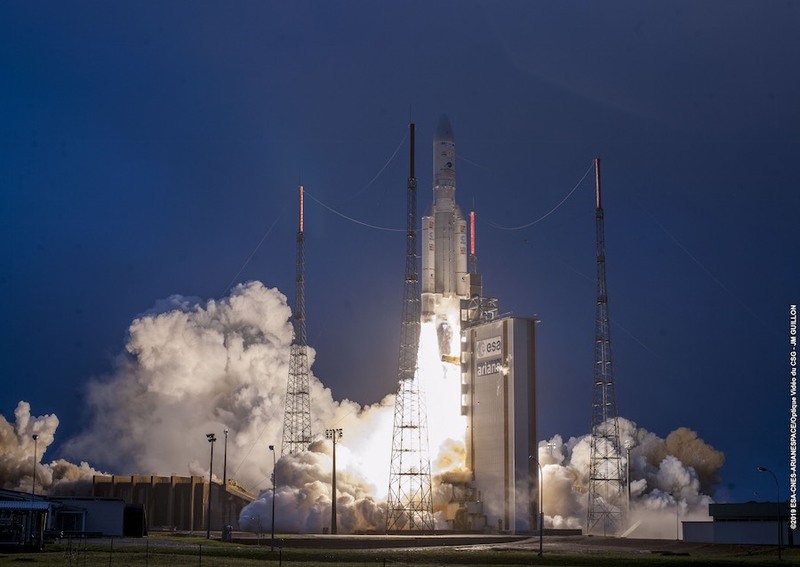 It was the first of up to five Ariane 5 flights this year, and up to 13 missions planned by Arianespace from French Guiana in 2019. It marked the 103rd Ariane 5 flight overall since 1996. The rocket’s Vulcain 2 main engine, fueled by liquid hydrogen and liquid oxygen, ignited around seven seconds before liftoff and throttled up to full power. 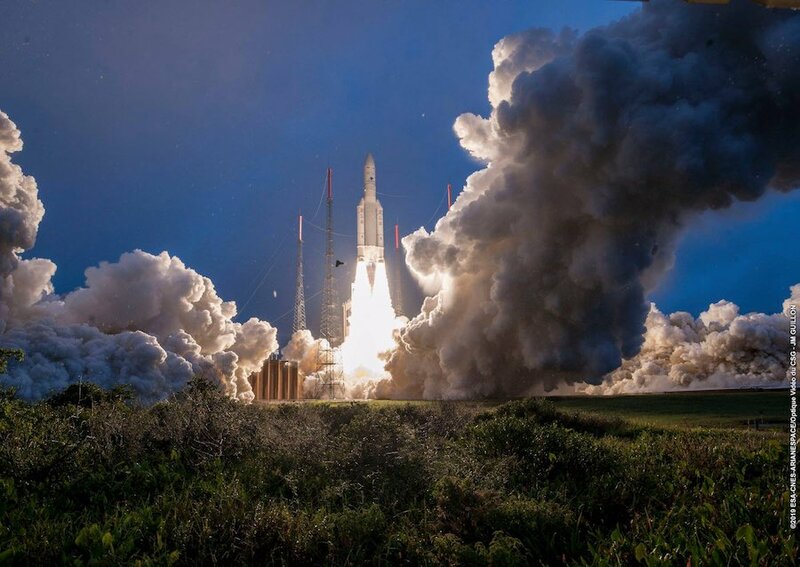 After the main engine passed an automated health check, the Ariane 5’s on-board computer commanded its twin solid rocket boosters to ignite, driving the launcher off the pad with nearly 3 million pounds of thrust. The video released by Arianespace and CNES, which manages the range and support infrastructure at the space center, shows views from high-speed engineering cameras, capturing imagery of the retraction of the launch pad’s upper stage fueling arms, the disconnection of umbilicals, and the closure of explosive shielding to protect ground hardware from the fiery exhaust produced by the Ariane 5’s engine and boosters. The payloads aboard the rocket were the Hellas-Sat 4/Saudi Geostationary Satellite 1 and the GSAT 31 communications spacecraft. 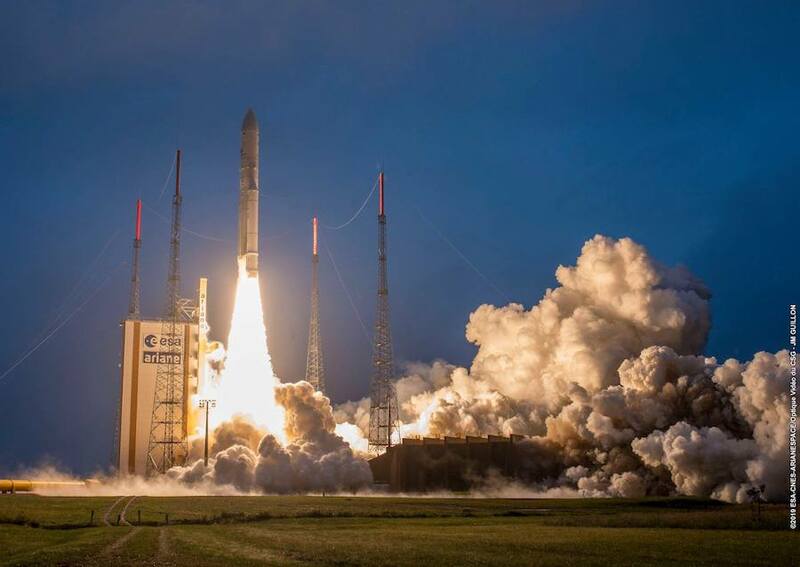 Built by Lockheed Martin, Hellas-Sat 4/SGS 1 is a multi-use craft for King Abdulaziz City for Science and Technology, or KACST, a government research institute in Riyadh, Saudi Arabia, and Hellas-Sat, a subsidiary of Arabsat headquartered in Cyprus. The satellite will provide communications for the Saudi government and military, and beam television programming to Europe, Africa and the Middle East. The GSAT 31 satellite, built and owned by the Indian Space Research Organization, will support communications networks, broadcast television programming, and provide cellular backhaul connectivity across India and neighboring islands.